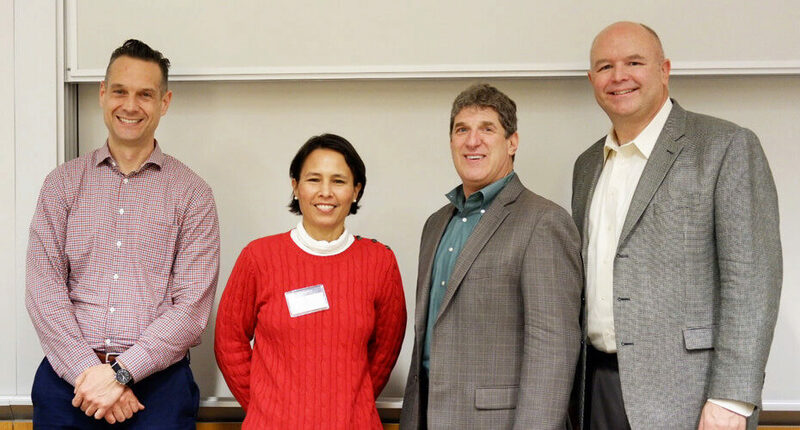 Jack Roswell, Julian Vallyeason, and Alex Zhuk (Brown University); Laura Gao, Jaimie Carlson, and Adam Zachar (University of Pennsylvania); Deepak Atyam (Purdue University); and Greg Howard (University of Pennsylvania). On Saturday, February 25th, 2017 five finalist teams from across the country came to Penn to pitch their solution to a problem related to air or space. The inaugural Penn Aerospace Pitch Competition, hosted by the Penn Aerospace Club, invited teams of 1-5 undergraduate and graduate students to propose aerospace-related startup ideas for a chance to earn prize money and feedback from industry leaders. 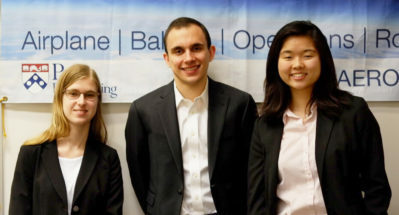 The five finalist teams, hailing from Brown University, Purdue University, Rutgers University, and the University of Pennsylvania, were selected out of 24 entrants from 10 schools across the nation. The proposals were judged based on their articulation of the problem to be solved, impact of the solution, market potential, technical feasibility, and entrepreneurial factors. Taking the first place prize of $5,000 was Penn’s own ProtoFluidics, a platform for microfluidics research in space presented by Jaimie Carlson (ENG ’18), Laura Gao (W ’18), and Adam Zachar (ENG ’18, GEE ’18). The team plans to bring streamlined rapid prototyping to microfluidic research in space and on Earth. “Using our modular microfluidic architecture, custom software platform, and the 3D printer already aboard the International Space Station, we will allow researchers to design, create, and test microfluidics in space cheaply and quickly,” said team member Adam Zachar. The team’s proposed technology will scale to terrestrial development, allowing researchers to iterate and share designs far more easily than they could before. “Eventually, we believe 3D printing microfluidics will become an integral part of both industrial & academic microfluidic research, in space and on earth,” Zachar added. This spring the team plans to start on-boarding their first customer academic labs, in parallel with working to secure their first 3D print aboard the International Space Station. Taking second place and $2,500 was Deepak Atyam, a solo entrant from Purdue University who pitched Tri-D Dynamics, a joint design manufacturer of rocket engines. The third place winners were Jack Roswell, Alex Zhuk, and Julian Vallyeason from Brown University, who presented Pursuit Solar, a venture focused on building a UAV capable of sustaining flight by harnessing energy from the sun. The two runners-up included Horus, drone technology for surveying the rainforest, presented by Penn’s Michael Raevsky (W ‘18, C ’18), and Project RoCED, a device for deorbiting space debris, presented by Tanumaya Bhowmik, Qilong Sheng, and Luc Bontoux of Rutgers University. “The presentations were all very impressive! It was inspirational to learn about the aerospace innovations these young entrepreneurs envision,” said Greg Howard, founder and director of the competition. Competition judges Daniel Lockney (NASA), Ellen Chang (LightSpeed Innovations), Dan Newman (Boeing), and Steve Gaines (ATLAS Space Operations). Serving as competition judges were Dan Newman, Senior Technical Fellow of the Boeing Company and Chief Engineer for the Phantom Works Rotary Wing Aircraft organization; Ellen Chang, Co-Founder and Managing Partner at LightSpeed Innovations; Steve Gaines, Chief Engineer at ATLAS Space Operations; and Daniel Lockney, Technology Transfer Program Executive at NASA Headquarters. Interested students and professionals can learn more and sign up for updates about next year’s Penn Aerospace Pitch Competition at pennaeropitch.com. The Penn Aerospace Club is building a community of future aerospace entrepreneurs and engineers at the University of Pennsylvania. They have three project teams that design, build, and launch rockets, aircraft, and high-altitude balloons, as well as an Operations Team and a new Pitch Competition Committee. In addition to their engineering projects and the Penn Aerospace Pitch Competition, last year the Penn Aerospace Club developed and hosted a course on Space Strategy and Economics. By sponsoring, we provide the foundation of confidence to young entrepreneurs to begin their journey. Having spent decades grooming and empowering others to achieve and grow has been immeasurably rewarding. We are investing in a greater aerospace ecosystem at its earliest stage of life. 2018 will be an even more productive year. Press on!